Your journey is full of excitement at rustic Camp Hamilton. 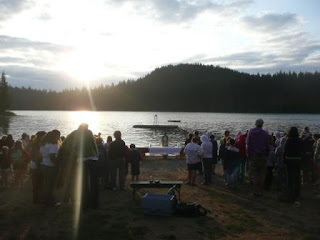 570 acres of forests, an 80 acre lake, and countless scenic vistas help you grow closer to God. Swimming and boating on the lake, archery, hiking, climbing the wall, and experiencing our new high ropes courses, are just some of the adventures you and your cabin mates help choose. At night sing around the campfire, sleep under the stars or go on a night hike. You’ll have a week full of fun at Adventure Camp or one of Hamilton’s specialty camps. CLICK THE SCHEDULE BELOW FOR A CLOSER LOOK AT DATES AND RATES! Adventure awaits you with an exciting twist on traditional camp activities. Gain a new appreciation of God’s creation through nature activities, camping skills and exploring camp. Get ready for an exciting session rushing down trails and roads on a mountain bike. Learn the basics of safe riding while enjoying some great trails. Experienced counselors challenge campers to reach individual and group goals. Campers are divided into riding groups based on skill level. Campers must bring a bike and helmet to camp. Have you ever wanted to play those camp songs you know and love? Bring your acoustic guitar to camp and a portion of the day will be spent learning to play the guitar or take your current skill to a new level. Campers must bring a guitar. Learn about light, composition, shutter speed, framing, and all the elements that go into taking great pictures. What better way to capture the beauty of nature? Campers must bring a digital camera. Want a true horse country experience? Spend the week living in covered wagons and eating breakfast or lunch in a country-style shelter. Whether you’re brand new or an experienced rider, you’ll love Hamilton’s unique horse programs. Play games, ride obstacle courses, explore the trails on horseback, and learn the basics of horse care. Campers are assigned riding groups by skill level. Boots with ¾-inch heel and smooth sole are required for horse programs. Spend 1½ to 2 hours per day learning the basics including walking and trotting. Improve your balance at a trot and lope, and learn responsible and safe trail riding. Spend 2 to 3 hours per day riding, caring for, and learning about horses. Strengthen your camping skills, cook over an open fire, hike to the top of Mt. Stohr, learn about nature and each other away from main camp on a four day expedition you won’t forget. This legendary original trip is open to those with or without outdoor experience. If you’ve been to Tatanka and are ready for a more challenging expedition Tatanka 2 will test your outdoor living skills. then put them to the test in this safe and challenging week.